On today's edition of styling secrets, we're going to be talking about stripes for this winter season! Stripes have been around since the dawn of time, and I bet they'll be here even when everyone is in flying cars. They're a favorite print of mine, and I definitely own way more black and white striped shirts than one person will ever need. Today I wanted to talk about how to wear a couple different kinds so that no matter what you pick out, you'll be sure to rock it! 1) The fancier stripped shirt: These kind of shirts are ones that have a little bit of a higher quality fabric and are great for the office or just when you want to look a little chicer. For me, the key to these is dressing up the shirt with chicer pieces as well, such as a cool pair of joggers and booties. However, don't overdo it. You will already have a print on top, so keep the rest of the outfit more neutral. 2) The striped sweater: My absolute favorite. This is where I love to play around with color and comfort. I suggest picking out striped sweaters with unexpected color combinations because just with that you'll look like you know what you're doing! Then, same as with point one, leave the rest of the outfit more neutral but play up the accessories. 3) Black and white stripes: As mentioned in the intro, I gravitate toward these the most as I am a neutral girl by heart. However, this is great because then instead of your focus is on the top/pattern, you can center your look around another piece of clothing, such as a really cool pair of jeans or a fun patterned shoe. The black and white combo gives you an ample amount of room to play around and is a staple print in anyone's closet. This sweater from Forever 21 is probably my favorite this season, because the color choices are honestly perfection. The hint of grey makes it super chic, and to go along with that vibe I paired it with high-waisted black jeans from Abercrombie, and for accessories, I added this double buckle belt from Amazon with my glasses from Eye Buy Direct. I kept the rest of the outfit pretty minimal to focus on the sweater with some cool accessories. This outfit is a fun way to dress up a sheer black and white striped shirt. Mine is from Nordstrom Rack and I paired it with a cute strappy brallete from Pac Sun. 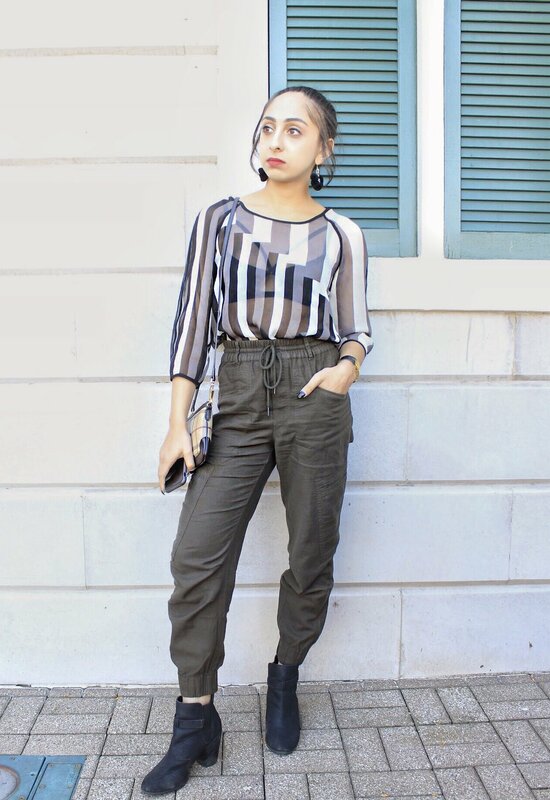 Playing up the chic vibe, I added these olive green joggers from Nordstrom Rack, with my black booties from Nordstrom Rack as well. For accessories I kept them gold toned and fun. I added my burbery purse with my micheal kors watch, and then these cool earrings from Rococo. This last outfit is super comfortable, but the cuts and details make it look very put together. I paired this black and white striped sweater from Nordstrom Rack with these silk flare pants from Nordstrom Rack as well, which creates a really cool and chill silhouette together. For accessories I added these fun silver earrings from Nordstrom Rack to keep with the cool tones, and then for comfort I added my espadrilles from Top Shop. And with that, I hope you got some fashion inspiration on how to style this print this winter season!